Welcome to the Buergler House on this drizzly rainy Monday. I've been wanting to do one of these for years but never took the time. Here's a glimpse at our day balancing home life, raising an almost two year old, and a part time job at our Church. It's not a typical day, but it's not an out of the ordinary day. Enjoy! 5:03 - Wake up. Check clock. Why am I awake? Seriously? I was supposed to sleep in today. Mind starts racing to all the things I need to do for work. 5:47 - Evie is stirring. Hmm. That's weird. Does she usually do this? Please don't wake up. 6:00 - Eric's alarm goes off, but it's Monday after a retreat weekend. I bet he hits snooze and we can lay and chat for a bit. 7:00 - Alarm goes off again. Eric gets in the shower I check Facebook and Twitter on my phone waiting for my turn in the shower. 7:08 - Shower, contacts, yoga pants and a tshirt. We're not going anywhere for a while. Might as well be comfy. 7:30 - Evie's up. Eric grabs her while I finish getting ready. He gets breakfast started. She's delighted that Daddy is still home. 8:00 - I take over breakfast duty. Eric leaves. Hhmm.. What to do today? What should we have for dinner? 8:30 - Sit down to tackle that work to-do list I made in my head while laying in bed. Turn on Curious George. Send work related emails and a follow up phone call. 9:05 - It's ONLY NINE O'CLOCK. For real. What are we going to do today? Ignore this question and play on the floor with Evie. 9:45 -- Check freezer and fridge for things to scrape together for lunch and dinner: frozen crock pot meal? check. broccoli? check. things to make lunch nachos? check. Evie sees me in the fridge and freezer and asks for ice cream, brownies and "nakey" (chicken) nuggets. Um, no. 10:16 - Evie's playing independently. Guess I'll fold diaper laundry so I'm not tempted to use disposables for no reason. I should probably wash another load while I'm at it. Toddler pee stinks if it's left too long. Check work email. 10:29 - Peek in on Evie. 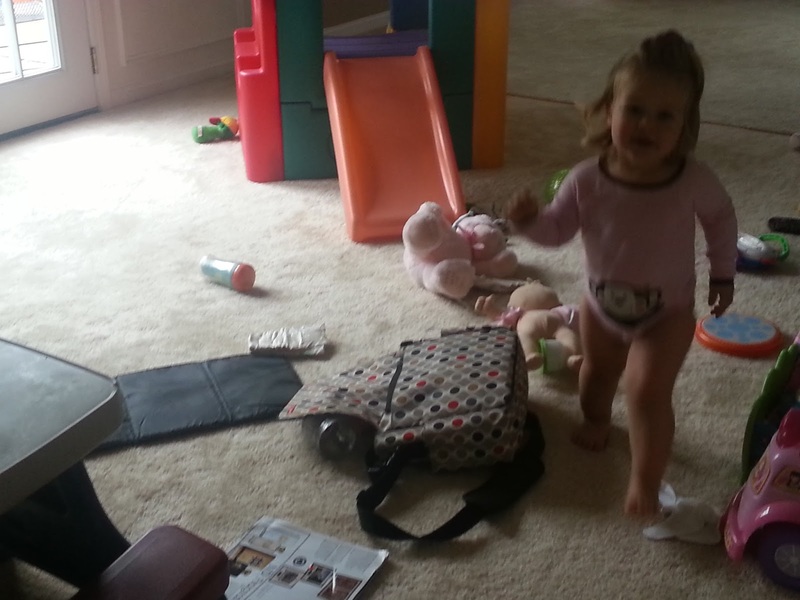 She's taken apart the diaper bag and is setting up a changing station for her dolls. This is new for her and too cute. Try to sneak a picture. 10:31 - Take Evie and the clean laundry upstairs. Put away laundry let Evie play with upstairs toys. "No Evie, you may not put the shampoo bottle in the butterfly net and throw it" Head back downstairs. Start dirty laundry. Why oh why did she mash avocado on the white shorts? Mental note to check the rest of the laundry for stains. 10:54 - Play pretend with Evie: change dolly's diaper, put her down for a nap, swaddle, repeat. 1:09 - Put Evie down for a nap after she tried to lick the dust pan. Ew. Time for my lunch and a little mommy R&R since I have to work tonight. Start with prayer time, then some Netflix. Check work email on iPad while watching Dawson's Creek. 3:06 - Wake up on the couch. How long did I sleep? Thank goodness for a little snooze! Check the monitor - Evie is still asleep. Wow, that's nice. 3:43 - Nana and Zachary arrive for a surprise play date with Evie, but by some miracle, she's still sleeping. 4:12 - Evie's been asleep for 3 hours. What? How? I go wake her up so she has time to play with her cousin. Take the babies outside to play in the water table. It's the first break in the rain we've had in 4 days. 5:31 -Nana and Zachary leave. Check crock pot meal. It's ready. Get ready for work and warm up a vegetable side dish. Broccoli or corn? Corn. It's been in the fridge longer. 6:19 - Finish scarfing down dinner. Chewing while putting on make up in a gift. Forgot to pray with Evie. Sit down for a few minutes to pray and eat with her so I can feel like we had family meal time. Eric should be home soon. 6:34 - Kiss husband hello and goodbye. Give baby girl a kiss and I'm out the door to work. I text Alyshia work questions while I'm stuck at red lights. 6:59 - Arrive at the office. Gather paperwork to prepare for our Teen Leader Meeting. 7:30 - Promptly start our teen leader meeting with a prayer, and quality time listening to their first two weeks of school. We go over their schedule, the Confirmation classes, and other things. Share a few laughs and wrap up in quality prayer time for their intentions and those in Egypt. 9:06 - Debate stopping for a milkshake on the way home, but I decided to get one with tomorrow's lunch instead. Arrive home to Eric folding laundry to a stupid movie. I engage in a little Twitter banter with our teen leaders. Yes I know we just left each other. 9:42 - Found a book on the Kindle that I'd started on a plane ride but never finished. Head up stairs to get ready for bed and to read while Eric finishes his movie. Eric comes up stairs and we chat. Turns out he mowed the lawn, put Evie down, cleaned the kitchen, emptied the dish washer, and started folding laundry. How did he do all of that in two hours? Miracle Man I tell you. 10:45 - Lights out. Bedtime prayers. Reflect on my day. Pray that I will fall asleep after taking a nap. And in seconds I'm out.